OLPC Oceania: PNG adopts OLPC to "transform country"
PNG adopts OLPC to "transform country"
PORT MORESBY, 25 November: Papua New Guinea today embraced the One Laptop Per Child (OLPC) project as the driver of a long-term plan to boost basic education and economic development in the poor South Pacific nation. Acting Prime Minister Dr. Puka Temu told an international summit of parliamentarians from over 78 countries that his government would move to roll out the famous green and white XO laptop to over 1 million school age children in PNG from 2009, after running a series of successful trials in schools and teacher training institutions throughout this year. "Our trials are already demonstrating that this single smart program is receiving a lot of enthusiasm and support. The Government is finalizing a National Policy for implementation in 2009," Dr Temu said at the Opening Ceremony of the 16th Session of the ACP-EU Joint Parliament Assembly, the world's only multi-national parliament through which the European Union engages with developing nations from Africa, the Caribbean and the Pacific. PNG is hosting this year's annual assembly in its ramshackle capital, Port Moresby. Dr Temu, deputizing for PM Sir Michael Somare, who was attending the APEC Leaders' Summit in Peru, told the gathering that in his government's "humble opinion (OLPC) will bring enormous benefits to our children, schools and teachers and the volume of benefits if rolled out fully, will cover over 7,000 Educational Institutions from elementary to secondary schools, benefit over 1,160,000 children and 35,700 teachers." The trials in remote schools and teacher education institutions were conducted with the technical assistance of the Secretariat of the Pacific Community and Divine Word University, part of the country's large faith-based education system. Half of the country's school age children are in no formal education, while the other half is split roughly between the church and state school system. From a population of about 6.25 million, half are under 19 years old. There are over 800 different languages spoken and 85% of our people live in rural communities based on the traditional village structure, and they are dependent on subsistence farming supplemented by cash cropping. 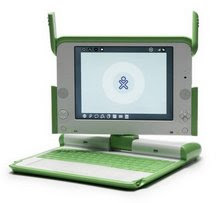 Dr Temu said the establishment of OLPC in remote rural areas will "transform this country and greatly narrow the digital divide." Later PNG's Secretary of Education, Dr Pagelio, in a speech to the ACP-EU's plenary, said his government's first priority was to improve the quality of its existing education system. "The short-term goal here is to complete our One Laptop Per Child pilot and planning phase in 2009 to cover 10,000 children or about 25 or so schools. The medium-term goal is to scale up One Laptop Per Child to reach all our children who are in Basic Education by 2015 (about 250 000 children). "As we improve quality, increase completion rates and build our capacity, we will also continually seek to bring more children into Basic Education." PNG's Cabinet is expected to endorse the long range program as part of its forty year strategy to 2050 to lift the country out of its unwanted status as one of the world's Least Developed Nations. This is fantastic news Michael, a huge congratulations!